A Geek In the Kitchen: Product Review: Titan Peeler! I'm always on the lookout for good solid kitchen tools which make my life easier, and perform well. I generally stray from what AB would call uni-taskers when at all possible (I only have so much kitchen storage. Don't have room for fluff), but for those few things where you really do need a dedicated tool, I like finding good products. 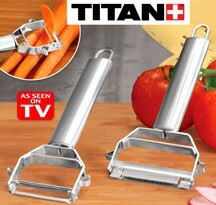 I had seen the hype for the Titan Peeler on TV and in magazines, and I remember thinking it was a really nice tool. Peeling vegetables is one of those things where if you don't have a sharp peeler or you don't really know how to use one, it not only is dangerous, but it really becomes a chore to peel with. I've always been a fan of a nice sharp pivoting hand held peeler like Mom used. Never had a major problem with them, and they were nice and simple. At least that's what I thought until I picked up my Titan the first time and set to work on some potatoes. Because of the nature of the design and the way the blade is mounted, you can peel in both directions without shifting your work. It makes peeling extremely fast. The blades are serrated and very sharp, and make light work of a pile of potatoes. I've peeled apples, carrots, cucumbers, and others. I haven't yet attempted shaved chocolates or cheeses, but the Titan is made to do both, and the hand-feel leads me to believe it would be a snap to do it. Reading on Amazon, the biggest complaint, humorously enough, is that the blades are TOO sharp. People apparently don't know what to do with a peeler that actually works, and end up slicing themselves up. I can see why this would happen. If you aren't paying attention, you can peel yourself! The julienne tool is also pretty nice. I don't seem to use it as often, but it has worked fairly well the times I've tried it. It doesn't glide quite as smoothly since in addition to the peeling-like-blade, there are vertical mini blades that divide the peel into nice uniform straws, but it works well. I haven't put it up to any serious abuses yet. Maybe this fall I'll try and peel an Acorn squash for fun. That would be an interesting test. But abuses aside, I would definitely recommend it to anyone looking for a nice upgrade from the run of the mill peeler. My other previous favorites now sit in the drawer unused, and I'm inclined to think it will stay that way.